2014 Rock and Roll Hall of Fame Les Paul - Antique Pelham Blue, LP-Shaped Guitar from Gibson in the Custom Shop Les Paul series. The Gibson Custom Shop and Cleveland Rock and Roll Hall of Fame partnered once again in 2014 to recreate a legendary Les Paul Custom. The 2014 Edition of the Gibson Rock and Roll Hall of Fame Les Paul Custom recreates the 1950’s guitar, with some exclusive aesthetics features such as the Antique Pelham Blue finish that mirrors the “greening” process of a lacquer that spent many years in the light. You’ll also find a HOF Pyramid logo inlaid on the headstock, “The Rock and Roll Hall of Fame” laser etched on the 12th fret inlay and a commemorative plate on the back of the body. Only 15 copies of this Gibson Rock and Roll Hall of Fame Les Paul Custom have been created, they are available at the HOF website for $8000. 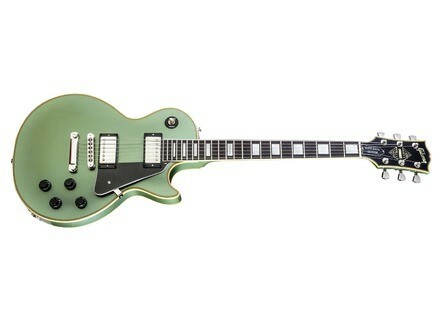 More details about the guitar at www.gibson.com. Jason Becker signs a Seymour Duncan pickup Seymour Duncan announces the new Perpetual Burn guitar humbucking pickup signature Jason Becker. ENO Myomorpha Distortion released ENO Music has released Myomorpha, a distortion pedal inspired by an überfamous rodent stompbox of the 90s. The Schecter Hellraiser Hybrid guitars are out The Hellraiser Hybrid series of electric guitars introduced by Schecter at NAMM las January are now available in stores.